2. Cook pasta according to package directions. 3. Meanwhile, heat 1 tablespoon of the oil in 12-inch nonstick skillet over high heat until shimmering. Add chorizo; cook and stir 1 minute or until it begins to render fat; set aside. 4. Toast chilies in a large skillet over medium heat, shaking pan constantly, 3 to 7 minutes or until fragrant. Transfer toasted chilies into blender container. 5. Heat remaining 2 tablespoons of the oil in large Dutch oven over medium to medium-high heat until shimmering. Add onion; cook 8 to 10 minutes or until softened, stirring occasionally. Stir in tomato paste; cook 1 to 2 minutes. Stir in garlic, oregano, salt, pepper, cumin and coriander; cook 1 to 2 minutes or until fragrant, stirring frequently. 6. Sprinkle in flour; cook and stir 1 to 2 minutes or until flour is blended into the onion mixture. Slowly add broth, stirring constantly and scraping any browned bits from bottom of Dutch oven. Continue cooking until sauce is slightly thickened, about 3 to 5 minutes, stirring frequently. 7. Add sauce to blender with chilies and process until smooth, about 30 to 40 seconds. Return sauce to Dutch oven. Add pork, breaking up with a wooden spoon or spatula. Cover; cook pork in sauce over medium to medium-high heat until fully cooked, about 15 to 20 minutes. Stir in scallion whites, 1/2 cup of the cilantro, and the lime juice. Set aside. 8. Combine Chihuahua cheese and queso fresco in large bowl; set aside. 9. Spread about 1/2 cup of sauce over bottom of 9x13-inch baking dish. Layer 4 lasagna noodles, 3/4 cup of sauce, 1/2 cup cheese mixture. 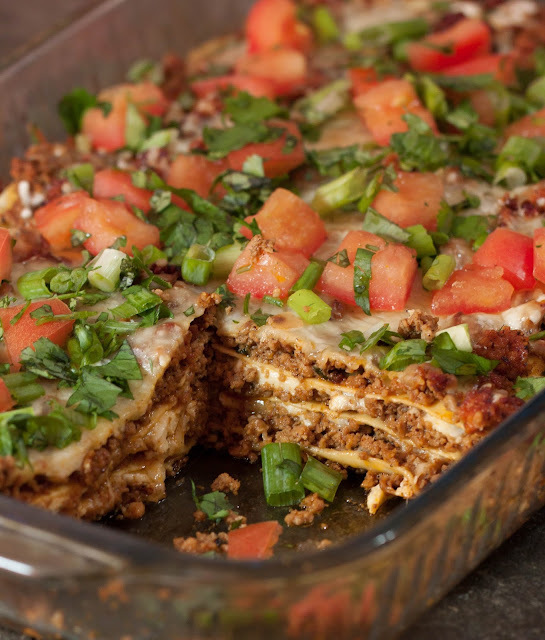 Repeat with 4 more lasagna noodles, 3/4 cup sauce, 1 cup cheese mixture. Top with remaining 4 lasagna noodles, remaining sauce, chorizo, and remaining cheese mixture. 10. Cover baking dish with aluminum foil; bake 15 to 20 minutes or until cheese is melted. Remove aluminum foil; sprinkle with cojita cheese; bake 10 minutes. Remove from oven. 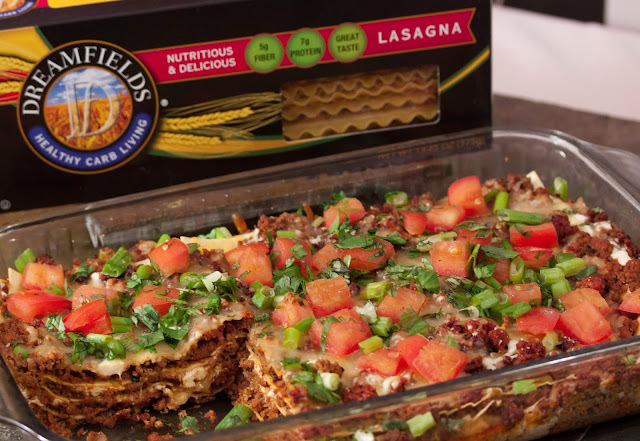 Let lasagna stand about 10 minutes. Sprinkle with tomatoes, scallion greens and remaining cilantro. Want to win some of your very own Dreamfield’s Pasta? Here’s how ... courtesy of Dreamfields Pasta! A family prize pack of Dreamfields Pasta PLUS a $25 gift card to spend as you choose! Leave a comment below letting me know what’s the first dish you’ll be making using ‪#‎Dreamfields‬ Pasta. That’s it! For additional entries, share this post on Facebook, Instagram or Pinterest using the hashtag ‪#‎HealthyPastaMonth‬. Then, leave me a comment BELOW letting me know you did. The contest is open to those 18 years of age or older and that have a valid continental USA mailing address. No purchase necessary. Odds of winning depend on the number of entries. One winner will be randomly chosen on November 7, 2015 and notified via e-mail. The winner has 48 hours to reply or they forfeit prize and an alternate winner will be drawn. 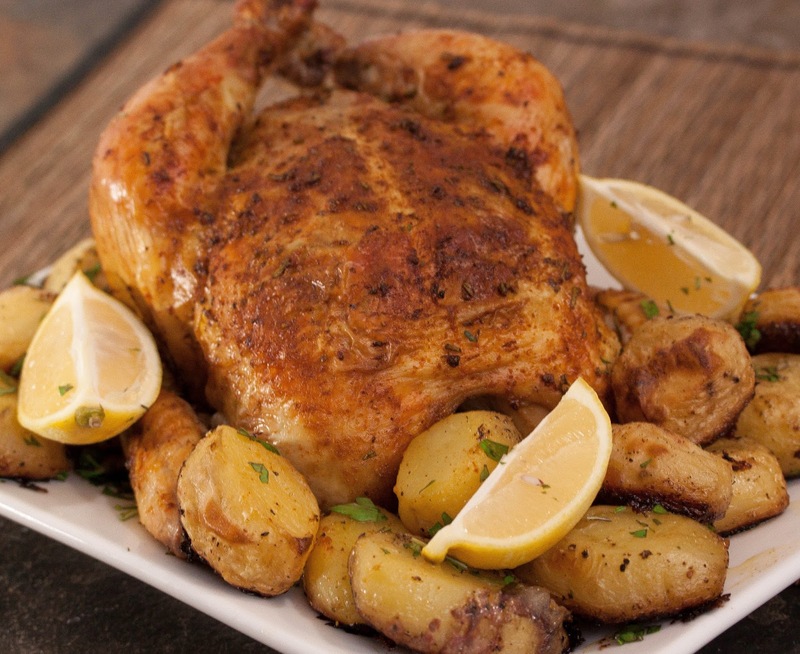 One-Pan Roast Chicken and Potatoes. One-Pan Roast Chicken and Potatoes: OO. Thyme. Smoked Paprika. Lemon Zest. Lemon Wedges. S & P. Whole Chicken. Yukon Gold Potatoes.